Besides bringing a holiday tree into your home, you can add life and color by decorating with other holiday plants. The poinsettia is a proven performer for festooning a corner, hearth or table top with seasonal cheer. With leaves of white, coral, pink, red or burgundy, as well as in variegated tones, poinsettias splash color wherever you put them. Try grouping several at varied heights (using upside-down terra cotta pots for perches), weaving greenery or garland into bare spots. Your florist will have wonderful blooming plants ready for you to start putting around your house. 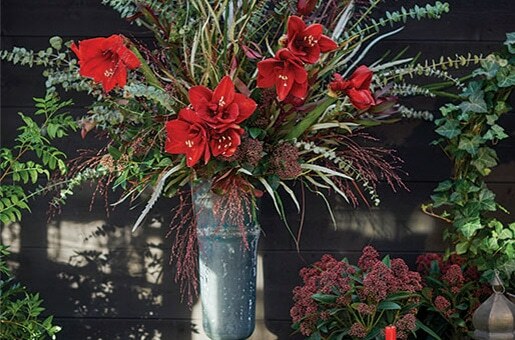 Pots of paperwhite narcissus and amaryllis forced into bloom, cyclamen and Christmas cactus will cheer you on through holiday parties and package wrapping. For something new, try an exotic orchid or dainty miniature rose plant. A holiday plant that will be at home the rest of the year is the Norfolk Island Pine. Its rows of soft branches are naturals for holding lightweight ornaments and a sprinkling of bows. You can use your pine as an accent or even as your holiday tree. Low on budget/high on creativity? Spruce up the houseplants you already have. Wrap foil around some of your larger pots and finish off with huge red bows. Mass several plants, and string twinkle lights among the branches. So go beyond tree decorating this year, and use special plants to spread the colors of the holidays all around your home.